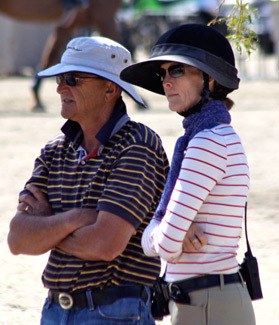 Jenny and Kost Karazissis are married members of the legendary equestrian family which also boasts daughter, Katrina, Nick (Kost's brother) and Nick's children, Cassandra & Nick Jr. The name Karazissis is synonymous with tradition & excellence. The family's Far West Farms (FWF) in Calabasas, California, has been a leader in the sport longer than almost any other establishment. Theyʼve proven over and over that thereʼs no substitute for experience and dedication. Their focus, building a partnership between horse and rider that is based on communication and understanding, has brought them a high level of success in the show ring, year after year. Kost and Jenny discuss and demonstrate your many options when it comes to correctly navigating bending lines. If you liked this video and want to learn more about perfecting a bending line, check out Missy Clark's topic Landing the Lead for Seamless Bending Lines. In this session Jenny and Kost Karazissis show us one of the methods they use to make a horse jump its best. Jenny demonstrates on both a hunter and a jumper. Both horses show how the exercise makes them express themselves more vertically and improves their technique and arc. Get to know this dynamic duo, from their introduction to the sport to their biggest influences. Youʼll be riveted by their amazing history together - truly an inspirational love story. Also, Jenny gives us a play by play of her beautiful Pro Challenge win aboard "Touchstone" at the Capital Challenge Horse Show. Get to know this dynamic duo, from their introduction to the sport to their biggest influences. Youʼll be riveted by their amazing history together - truly an inspirational love story. In this session Team Karazissis describe & demonstrate exercises that establish direct communication to the three main parts of the horse & stimulate the haunch in order to facilitate the lead change.